Takeaway: Embryos are graded in an attempt to decide which have the strongest possibility of achieving a successful pregnancy. Each clinic has its own grading system. If you have undergone or are planning to undergo a cycle of in vitro fertilization (IVF), you have likely have heard that any embryos created through the process are likely to undergo a process of grading. This assessment is done by an embryologist in the lab to assess embryo quality once the cells of the embryo start to divide. Please note that there isn't one standard method of grading embryos. Each clinic has its own grading system. You will need to ask your clinic how the grading of your embryos will be performed. That said, there is some technical terminology involved in understanding the basics of how embryos are graded. We hope this guide can provide you with the knowledge needed to understand how this process may be done at your clinic. Embryo grading is done primarily to assess the overall quality of the embryos and so the doctor can give you information about your IVF cycle both during and after the cycle. It is a way to assign a scientific "value" to each embryo and allows the embryologist to choose the best ones for transfer and freezing. Embryos with a higher grade are more likely to implant with the uterine lining, most likely because these embryos have a higher chance of being chromosomally normal. In other words, not all embryos are created equally and it is possible to select the genetically normal embryos that are more likely to grow. 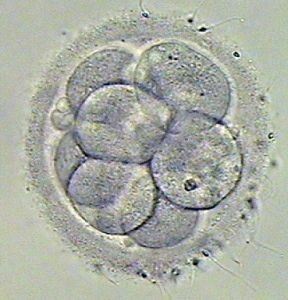 What if my embryos have a poor grading? Most people have a range of grades within their group of embryos from an IVF cycle and the embryologist will pick the best ones out of that particular group. We have seen babies born from different grades of embryos, so try not to focus on the numbers too much. Although lower grade embryos have a less of a chance of implanting than their more handsome counterparts, it’s still possible to achieve a pregnancy from embryos that are not ideal when viewed under a microscope. Remember that the grading isn't a perfect science and no one can tell for sure if an embryo is going to implant and grow just by looking down the microscope. To understand grading, it helps to first have an understanding of how embryos grow. When an egg is fertilized by a sperm it is called a zygote and is 1 cell. To grow, the zygote does not get bigger, but rather it goes through a process of cell division (called meiosis) by dividing from 1 cell into 2 cells, then 4, 8, 16, 32 cells, etc..
How does embryo grading work? 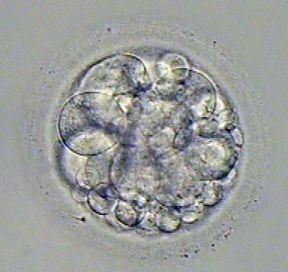 In the lab, it is common to see a wide-range of quality within a batch of embryos. 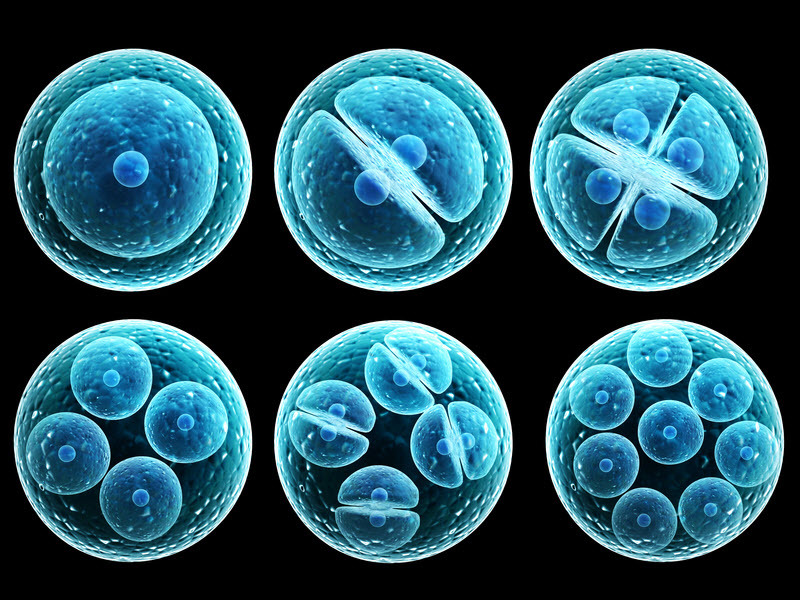 It’s rare to see all embryos looking identical once they start the process of dividing into multiple cells. The number of cells: the number should be appropriate for the day of development. Size, shape, and degree of diversity in the size of cells: an even number of equally sized cells is best. Clarity of the cytoplasm inside the cells: the interior of the cells should be free of inclusions and dark areas. The extent of fragmentation: fragmentation occurs when a cell divides and parts of the cell break off. This causes the embryo to have smaller buds or fragments of cells surrounding the larger cells. For example, a lab might have a grading system from 1 to 4, where 1 is the best quality and 4 is the poorest quality. 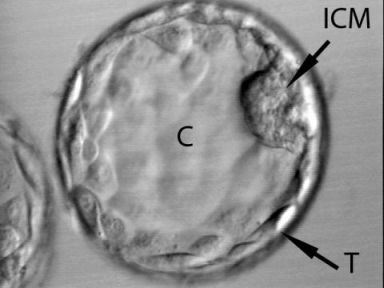 For cleavage stage embryos (Days 2 and 3 of development), the grade includes two numbers; the first is the number of cells, the second reflects the overall quality of the embryo. An 8/1 would be an eight-celled embryo of excellent quality; a 6/3 would be a six-celled embryo of poor quality, and so on. How Does Blastocyst Grading Work? On around day 5 to 6 of development is the all-important blastocyst stage. Because the appearance of the embryo at this stage is dramatically different from earlier stages of development, blastocysts have their own separate grading system. At the blastocyst stage, the embryo takes in fluid to form a cavity so it is able to expand and hatch out of the protective shell called the zona pellucida. This hatching is necessary for an embryo to be able to eventually make contact and implant within the uterus. The trophectoderm (T): a single layer of cells around the circumference of the embryo that gives rise to the placenta and embryonic sac. The inner cell mass (ICM): a distinct clump of cells that form the actual baby. The cavity (C): is labeled on the following photograph. With blastocyst quality, the overall structure (expansion) is important as is the presence of the two different cell types. There are a total of 3 elements graded to assess quality for each blastocyst. The following is one example of a blastocyst grading system; your clinic may use a different system. The blastocyst is designated a numerical value between 1 and 6. This reflects the degree of expansion, or how much fluid the embryo has taken into the cavity. A Grade 1 embryo has just started to take in fluid and show signs of expansion and is still in the early stages. As an embryo takes in more fluid, the grading system reflects this with a 2, 3, or 4 grade, depending on how much fluid is inside the cavity and how big the embryo has grown. Grade 5 describes an embryo hatching out of its shell. Grade 6 describes an embryo fully hatched. Next, come two letters, A, B, or C. The first letter describes the quality of the inner cell mass (or baby making) cells. If there are many tightly packed cells, the embryo gets an A grade. If there are fewer cells more loosely packed, it gets a B grade. If there are few cells, it receives a C grade. The grading system for the T cells follows a similar pattern, with A being the best and B and C being poorer quality, meaning the cells are less organized. A blastocyst grade is a combination of all of the scales above. For example, an embryo with a grade of 4AA is fully expanded with good-quality and well-organized ICM and T cells. A grade of 3AB reflects a full blastocyst with a good inner cell mass and less well-organized, or slightly poorer quality, trophectoderm cells. Remember that babies are born from all different grades of embryos are most people have a mixture of good, medium, and poor quality embryos from a single IVF cycle.